The Kola Peninsula (frae Northren Sami: Guoládat; Roushie: Ко́льский полуо́стров, Kolsky poluostrov) is a peninsula in the far northwast o Roushie. 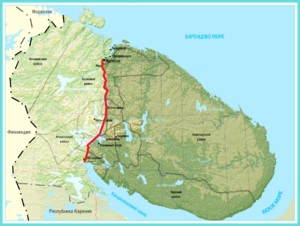 Constitutin the bulk o the territory o Murmansk Oblast, it lies awmaist completely inside the Arctic Circle an is bordered bi the Barents Sea in the north an the White Sea in the east an sootheast. The ceety o Murmansk is the maist populous human dounset on the peninsula, wi a population o ower 300,000 as o the 2010 Census. ↑ The area of the peninsula is 100,000 square kilometers (39,000 sq mi); vs. Murmansk Oblast's total area of 144,900 square kilometers (55,900 sq mi).